See, there was a time when Tim Burton made great films – Ed Wood, Batman, Edward Scissorhands, Beetlejuice, The Nightmare Before Christmas. That time has now passed. The Tim Burton of now, the Tim Burton of this generation, is a caricature filmmaker; he produces the kind of dreamy, whimsical films that look gorgeous but, like dreams, rarely make a hell of a lot of sense upon reflection. They are also sadly as forgettable. Dark Shadows is mediocre gothic black comedy – not witty enough to be consistently funny and not quirky enough to be memorable. As a broad retelling of the classic 1960s and 70s television series, it involves some key elements: vampires, monsters of classic horror lore, and a fish-out-of-water setting that ties the whole bundle together. Barnabas Collins (Johnny Depp) chews more scenery than he does jugulars as the classically gothic vampire who is awoken in 1970s coastal America. He vies for the affection of Victoria Winters (Bella Heathcote) after centuries of imprisonment by evil witch Angelique Bouchard (gorgeously menacing Eva Green). He returns to the manor of his youth, now owned by distant relatives and their disaffected offspring – a dangerously jailbaiting Chloe Moretz among them. You can’t tell which Tim Burton film this is. Neither can we. Neither can Tim Burton, apparently. The first half of the film is certainly Dark Shadows’ strongest. The heavy-handed introduction aside, watching Barnabas adjust to modern life is pretty entertaining stuff. I mean, there’s still the usual repertoire of ‘oh– he doesn’t understand what a car is!’ and ‘oh– he thinks the television is full of tiny people!’ is used, but Depp’s charm still powers through jokes dustier than Barnabas’ coffin. There’s swagger in this first couple acts; the soundtrack is a foot-thumping mix of 70s rock anthems and acoustic ballads, tied expertly to some very sharply edited montages. This is Tim Burton at this tightest this time around. He sketches the 1970s in faded reds and oranges, playing the coastal township off against pale blue-grey skies and silvery thunderheads. Again, the visual punch of great art direction still staggers – but it’s a balloon attached to a dead weight story that was in need of serious refinement. Helena Bonham Carter’s lecherous character feels like it was thrown in there on a whim – and, given she’s Burton’s spouse, it wouldn’t surprise us. The final act, however, is the true folly. Dana Scully lookalike winner 2012 – no contest. Without spoiling things, Dark Shadows feels like it had its ending ineptly rewritten to blow as much of the effects budget as possible in the most hamfistedly teen-crowd-pleasing way possible. It takes the sometimes delicate visual style of the first half and tosses it on the fire. It begins to lose the menace Barnabas (and Depp) work towards as he faces off against an increasingly silly series of threats. It’s a shame, really. There was a lot of potential here – but like so many recent Burton films (with the exceptions of perhaps Big Fish and The Corpse Bride), it just doesn’t know when to pull punches. Dark Shadows throws far too many characters into the mix, never giving enough screen time to any of them in order for the audience to build a rapport with them. Likewise, it tosses ‘twists’ at the audience that are never alluded to before the end, making their inclusion (and use as a plot-saving device) baffling to watch. What is left is Burton’s now customary visual motifs– the haunting thickets at midnight, the pouty lips and wide eyes of his heroines. He loves a good vista too, and Dark Shadows is never short on stunning backdrops and impressive cinematographic techniques. It looks a treat. 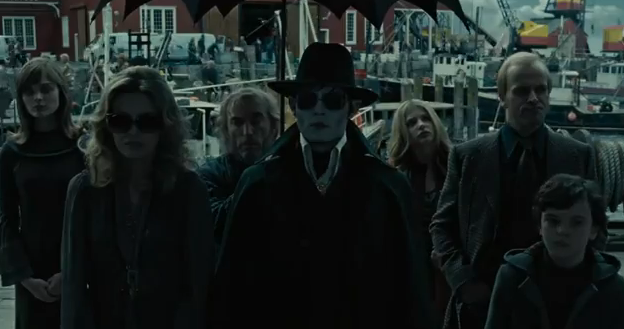 But with Dark Shadows, like Depp himself, you can only put so much make-up on an ageing face and sell it as fresh. Disappointing to say the least. I’m thinking maybe they need to allocate him a smaller budget so he has to make more with less. Hey Patrick, great review, I think you pretty much hit the nail on the head when it comes to what I expect from Timothy Burton nowadays. Sad to see that this trend continues.. I’ll still watch it, but won’t set any unrealistic expectations. Oh, and am I one of the few who actually thought Sweeney Todd was decent? Aside from that, since 1995, Mars Attacks, Big Fish and Corpse Bridge are the others that I actually have any real recollection of. The rest were completely forgettable. I think the issue with Burton is that the magic is gone. The visuals are always beautiful, but without interesting characters or a complex plot, his movies are hollow shells. Contrast this with the surrreal and fantastical worlds that Terry Gilliam manages to create on shoestring budgets..Quite simply,Terry GIlliam still has it. Burton doesn’t. Thanks for the review. I was so hopeful years ago when I learned that Johnny Depp had a “stake” in the movie and would be portraying Barnabas. I was so disappointed when I learned that Tim Burton would be directing. I’m of the generation that ran home from school to watch the soap ‘Dark Shadows’ when it aired live. It may seem like camp now but it wasn’t to me then. When I realized that this remake was a comedy, I decided that only glowing reviews would get me into the theater. Reviews that I’ve read have matched yours. Tepid at best. Enough of the Depp/Burton collaborations, PLEASE! I’m definitely not seeing this movie now.